At White Rose Equestrian Center we take your equestrian needs very seriously. 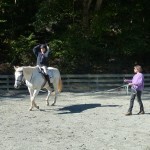 Our comprehensive lesson program is tailored to the individual needs of every rider. We build on what you have already accomplished and work to establish a strong, confident, balanced seat. Watch a video here to see what to expect in your lesson. 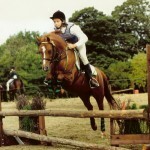 Our lesson horses and ponies are safe, well-schooled, confidence givers ready to bring out the best in every rider. You will be given the opportunity to ride a variety of different mounts, each will teach you something new. We also encourage our riders to take part in our shows and equestrian programs. Stable Management Lessons are offered as an 8-week course and cover subjects ranging from horse care, different types of tack, horse anatomy, nutrition, and much more. They include hands-on learning and all notes and literature relating to the subjects covered. They are available to groups of four or more and cost $200 per person. All first-time riders are required to take a private 30-minute lesson to assess their riding level. 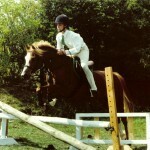 Once their riding level has been established they will be required to purchase a block of four lessons. At this time they will also be required to pay a one-time, non-refundable registration fee of $25. All riders are required to take private lessons until they can walk, trot, and canter independently after which they may join a group lesson if they so wish and space is available. Lessons are booked in blocks of four and paid for in advance. To cancel or reschedule a lesson you must give at least 24 hours notice or you forfeit the lesson. No exceptions. Payment may be made in cash or by check. Our lessons will go ahead in light rain and below freezing temperatures. Lessons will only be canceled for torrential rain, severe winds, temperatures above 98°, and/or lightening. We will contact you as soon as possible either by a phone call or text message if we need to cancel/reschedule due to inclement weather. If the barn needs to cancel a lesson due to inclement weather you will be offered a non-riding stable management lesson in replacement or you may reschedule as long as the four lesson set is taken within a six week period. If the barn needs to re-schedule a lesson due to a horse show or other activity you will be offered an alternate date within the six week period. In order to keep our horses fit and healthy, we have a weight limit of 200lbs. Thank you for contacting White Rose Equestrian, we will be in touch very soon. Learn More - Please enter your contact details and a short message, we will answer your query as soon as possible.